Insulation creates a year-round consistent temperature in two different ways - it keeps heat out during warm weather and keeps it in during the winter. It can also help to reduce noise transmission - both from the inside out and the outside in. Our additional insulation can cover it all - roof, walls and floor. This ensures your building is a comfortable outdoor space, whatever the time of year. Double glazing is an additional option, which can do even more to curtail heat loss. Following years of research, we have perfected the combination of current materials we use in our products. We continue to monitor the market and test out any new technologies, so we continue to deliver the best performance possible. 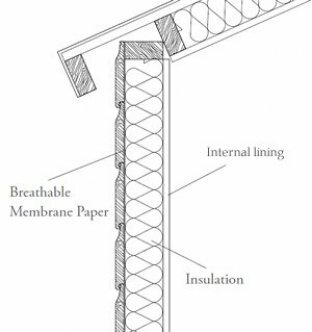 First, a breathable paper membrane is sandwiched between the external cladding and the interior studwork of the building. This traps moisture to reduce any impact on the interior. The cavity within the roof and floors are filled with expanded polystyrene sheeting, which has an A+ energy efficiency rating not to mention being flame retardant. Your choice of roof covering completes the final layer of insulation. We have multiple roofing options which include heavy duty felt, cedar shingles and grey composite slate tiles. We use high efficiency, fire resistant rockwool for insulating the walls. At 80mm in thickness, it is deeper than the timber framework, meaning it is lightly compressed when enclosed by the lining. This means every possible inch of space within the cavity has insulation packed into it. A final timber internal layer is applied, together with solid wood coving and skirting boards. 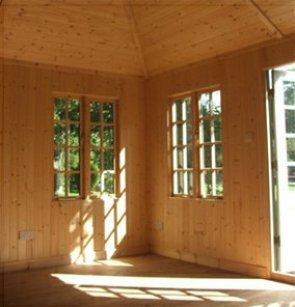 Our range of Garden Sheds and workshops are lined with oak-faced plywood, making for a warm and natural looking finish. 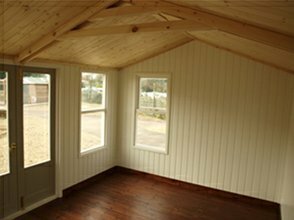 With our Garden Rooms, Summerhouses and Garden Studios you have the choice of a natural or painted matchboard finish. All our buildings (with the exception of our Classic Shed and National Trust range) can be fully insulated and lined, with many featuring this as standard. Insulation can only be installed at the time of construction, so unfortunately we are unable to insulate a building in retrospect. Should you wish to discuss your individual requirements with us directly, please do not hesitate to contact us. A member of the team will be more than happy to help with any questions you may have. Alternatively, you can see our full range of luxury bespoke Garden Buildings for yourself, by visiting one of our seven UK Show Centres.